During my Chinese engagement party (过大礼), my boyfriend came to my home with the gifts to ask for my hand from my parents. Few older relatives from his family came with him to represent sincerity and respect towards my family regarding this marriage. When they arrived, my family accepted some the wedding goodies to show we have accepted the marriage proposal. In addition, my parents prepared some gifts as their blessings for us-the couple. 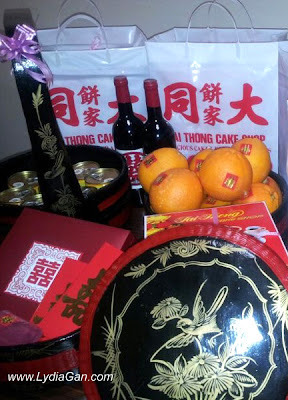 My parents also gave Ang Baos to his relatives who helped to deliver the gifts. My family cooked a feast to celebrate this joyful occasion, my mum prepared her famous Nonya Chicken Curry and Wuxiang. It can be purchased, borrowed or rented in Singapore. We have simplified some of our Chinese engagement gifts so as to make it more practical for our lifestyle. We are sharing our Guodali list to encourage more Chinese couples to keep the Guodali tradition. Traditions do not have to be cumbersome or inflexible. It can be modernized while retaining it's original good meaning. Gifts from the Groom's family. 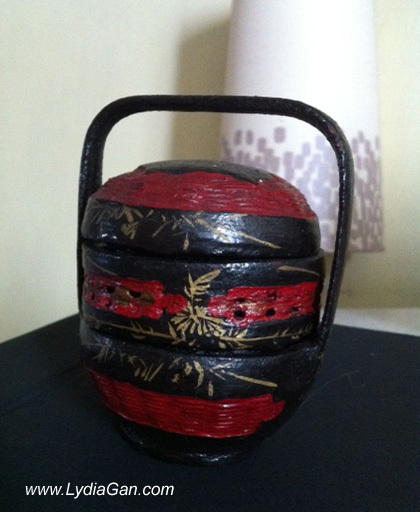 They are presented inside the Chinese Betrothal Basket. Gifts from the Bride's family. To be put in the Chinese Betrothal Basket and return to the Groom's family. Please note that all items are given in even numbers for auspicious sake. My fiance and I wanted to maintain Chinese traditions in our wedding. These traditions hold significant meanings and are part of our heritage. Guodali (过大礼) is a meaningful tradition in Chinese Betrothal custom. The purpose of this custom is to show respect for the bride's family and sincerity in the proposal of the marriage. Chinese wedding pastries (喜饼) are given to the bride during Guodali. Usually both families will compile the number of boxes of wedding cakes they need and order from the cake shop in advance. The groom will buy and collect the Chinese wedding cakes. He will bring it to bride's home along with other essential engagement gifts and 2 Angbaos. As a gracious gesture to accept the marriage and reciprocate the kindness ( 回礼 ), the bride's family will keep some boxes of the wedding cakes and return some boxes back to the groom's family with betrothal gifts and 1 Angbao. The Chinese wedding pastries will then be given to the couple's relatives with the wedding invitation card. I will cover more details on the gifts for Guodali in my next post. We ordered the Chinese wedding pastries (喜饼) for our marriage at one of the most popular Chinese bakery shops in Singapore. Address: 35, Mosque Street, Singapore 059513. Opening hours: Mon- Sat, 8.30am - 6pm. Closed on public holidays, 1 week for Chinese New Year holidays and moon cake festival. Tai Thong is famous for their traditional moon cakes and Chinese wedding cakes. There are not many such traditional Chinese pastries shops left in Singapore. Tai Thong have evolved with times and bake western cookies like Cashew nut cookies, Whole Almond cookies and Macadamia nut cookies too. These cookies are available at S$4.50 per packet. We chose to buy Tai Thong pastries as they do not use pork or lard. Tasty, light and healthy for our family and relatives! 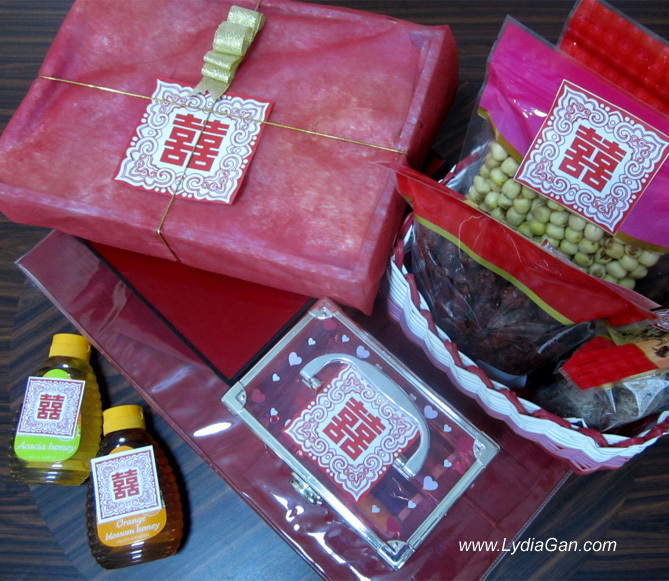 The above Betrothal gift set includes: 1 Doushabing (豆沙饼) , 1 Longfengbing (龙凤饼) , 1 Lianrongbing (莲蓉饼) and 1 Dourongbing (豆蓉饼). Cost S$5.80 each box. I hope more wedding couples will integrate this tradition in their wedding to keep our Chinese culture alive and support local traditional businesses.